The Indus blind river dolphin is facing extinction it was learnt on Thursday. The rare dolphin is fading away owing to the negligence of the Sindh Wildlife Department and factors such as water pollution, poaching and habitat destruction. .
Usage of insecticides and pesticides as well as other agricultural sprays is a major reason behind the decline in the numbers of blind river dolphins. In the 2010 flashfloods, dozens of these animals were either killed for their meat or swept away by the gushing water. The dolphin was declared an endangered species by the International Union of Conservation of Nature (IUCN). Furthermore, a number of industrial units discharge their waste directly into the river which is a great threat to marine life, especially to the said dolphins. These fading animals are often seen stranded in the irrigation canals. 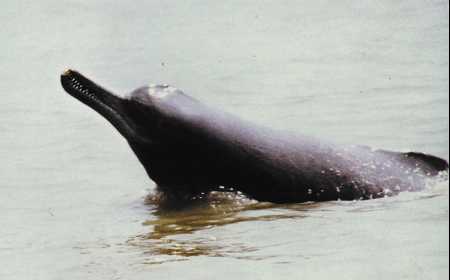 The Indus blind river dolphin is one of the world’s rarest mammals and the second most threatened river species. It is also known as “Andhi Bulhan”. It gives birth to one baby in a year. The dolphin is totally blind but, surprisingly, however it can differentiate between light and dark. The dolphin has been dwelling in the river Indus for millions of years. It is found only in Pakistan in only the lower Indus basin. It is one of the 39 species of the dolphins found in the world. The blind dolphin was once found in abundance in the Indus from Khyber Pakhtunkhawa to the delta. In the past, it also moved frequently to and from the Sutlej, Ravi, Chenab and Jhelum. It is pertinent to mention that the Sindh Wildlife Department had declared the area from Sukkur to Guddu barrages as ‘Indus Blind Dolphin Sanctuary’. At present there are about 1200 dolphins living in this stretch of the Indus. Indus dolphins are being poached on a large scale because its skin and bones fetch a very high price and are used in medicines. The Sindh Wildlife Department does not seem keen to rescue the unique dolphin as no concrete measures have been taken despite instructions given by the relevant authorities. A research has claimed that these dolphins become blind because of muddy water of Indus, but a few scientists believe that IndusRiver dolphins are inherently blind. Some researchers believe that it finds its way and food with the help of echolocation or through a system similar to the one used by bats. The dolphin eats fish and invertebrates such as clams, prawns, carp, catfish, gobies and herring. The 25 percent of Indus Blind Dolphins that live between Guddu and Sukkur barrages are stranded due to human activity. All countries except Pakistan are taking serious initiatives for the protection of such species as the IUCN has declared this dolphin “unique and endangered”. Unfortunately the authorities of Sindh Wildlife Department are not performing their role properly. If serious measures are not taken by the government of Sindh, the country might lose this unique animal. Thus, it is the responsibility of the Sindh Wildlife Department to take action against factories discharging toxic waste into the river. It is also the responsibility of the Environmental Protection Agency and factory owners to take some serious steps to secure the endangered dolphin. “All countries except Pakistan”. Why don’t the Pakistani’s who care about their countries precious natural resources and endangered wildlife do something about this? Are there people in Pakistan who care? About anything? yes, they are people in Pakistan who care about all this. however, there are much bigger problems to handle in Pakistan at the moment. If youre not a Pakistani you wont understand.. also giving you no rights to say anything. why why why , i love my country , but people living there must not.. as they are letting this happen…. why do people not wake up and start caring about wildlife and their environment .. so many animals are disappearing …. people dont wait for some one else to care ,, you have start caring yourself then maybe others will start caring aswell…..
Its so sad to hear news such as this, we really need more organisations such as PAWS, ACAP and Aisha Chundrigar to ensure the protection of animals. With companies like PetPeople.pk (http://petpeople.pk/) opening up an online store to serve the needs of pet lovers, Pakistan is really moving in the right direction to look after its population of furry creatures.